There aren’t as many online casinos that provide both download and instant play options for gamers as there used to be. However, for those players who do like a choice between the two, Miami Club Casino is able to provide such. This platform has been in operation since 2012, so it has a few years of experience behind it now and it makes up another part of the Deckmedia N.V. group casinos. Like its sister sites, Miami Club casino owns a gambling licence from Curaçao eGaming. Therefore, it provides a secure and fair gaming environment for all of its members. It also provides access for US gamers, with the US dollar being the sole currency that you can play in. Once you join this site and access the game lobby, you’ll be able to see its full selection of titles. These are provided to it by a single software developer, that being WGS Technology. This means that while it does have quite a unique enough game lobby available, the selection of titles on offer is smaller than other casinos. Furthermore, the downloadable version of the casino has slightly more options available than the instant play mode. However, speaking of the actual games, it’s the video slots that make up this site’s largest collection of titles. In this category, you’ll get the chance to play games such as Dragon Master, California Gold, Jurassic, Black Magic and Karaoke Cash. A few classic slots are also on offer alongside the more modern video slots. And there is even one or two of the rarer seven-reel games. Alongside all of this, you’ll also get the chance to play some truly appealing progressive jackpot games, such as Triple Wild Cherry. As alternatives to slot games, the site hosts four different blackjack variants and one of these is also a progressive blackjack game. 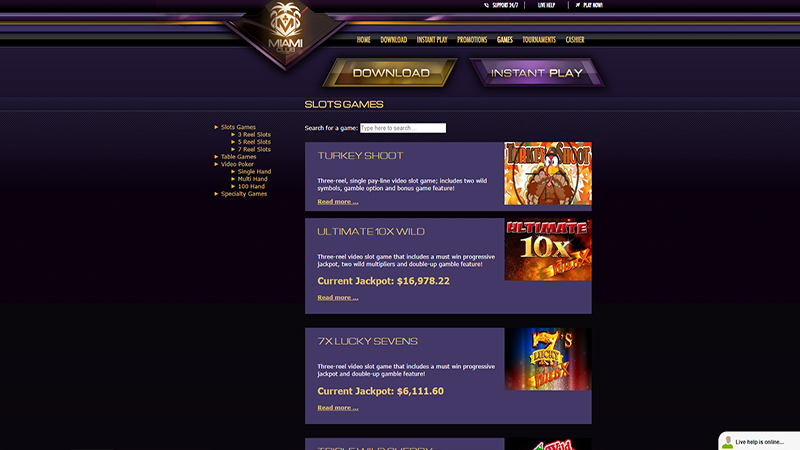 American and European Roulette games are also present at the site. You’ll get to play a few other table games, including several different versions of poker too. Finally, the casino also plays host to a variety of video poker offerings, such as Tens or Better and Aces and Faces. Therefore, it’s quite a diverse game lobby at Miami Club Casino, at least as far as the different types of games go. 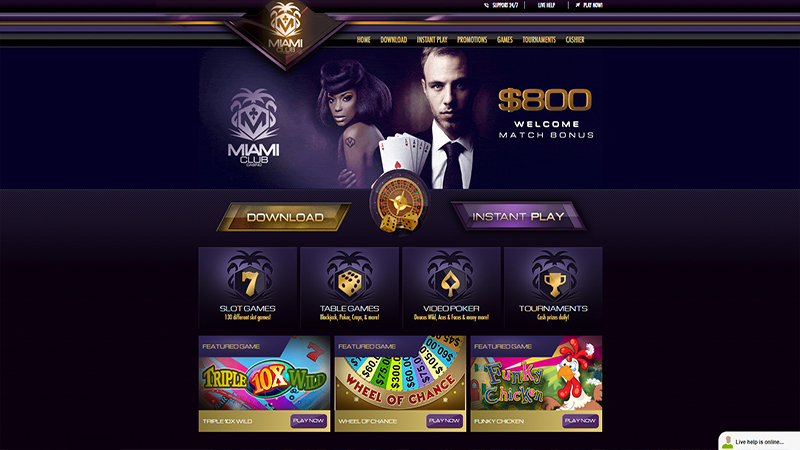 Once you have added funds to your Miami Club casino account, you can begin playing the games. However, there is also the possibility of claiming your fair share of special offers too. To begin with, new players have the opportunity to receive the Welcome Bonus, which provides up to $800 in total. Each and any of your first deposits there will be given a 100% bonus up to $100 each time. Therefore, in theory, the welcome package extends across your first eight deposits as a newcomer. This makes for a very nice welcome to the casino. However, don’t worry if you’re a loyal customer of the casino either. You see, you’ll also get the chance to benefit from your own selection of special promotions. Other than having emails sent out to you with seasonal offers and such, there is also The Miami Club, which is this casino’s VIP scheme. Comp points will also be collected as you play the range of games that are on offer, and they can be exchanged for bonus funds when you amass enough of them. Of course, you’ll need to deposit funds into your Miami Club casino account before you can do any of the above. Fortunately, there are a few different banking options open to members, starting with the regular offering of Visa and MasterCard credit and debit cards. If you prefer to use an eWallet, then the casino does accept deposits made via Neteller or Skrill. As a final addition to this selection, Bitcoin cryptocurrency deposits are also available to use. With the exception of the card options, all of the others are available to use for a withdrawal too, as is the addition of the Bank Wire Transfer or a Check Pay-out. There is the option of utilising the casino’s Live Chat function to receive assistance from the customer support team. Or, if you would prefer, you can use the email address provided or call them on the telephone. The support team are on hand on a 24/7 basis, meaning that players can seek out help at any time. Additionally, there is a FAQ section which also provides various answers for you to browse through. Miami Club casino has a very appealing design to it and the fact that it enables you to play via downloadable game lobby or instant play mode is a great perk too. With the 24/7 customer support team also being on hand, as well as a nice enough choice of games from WGS Technology, it’s a great location to join and play at. Play at Miami Club Casino Casino. USA Players Welcome!